The bride was not pleased her day got ruined. On the other hand, the groom was suspiciously smirky. 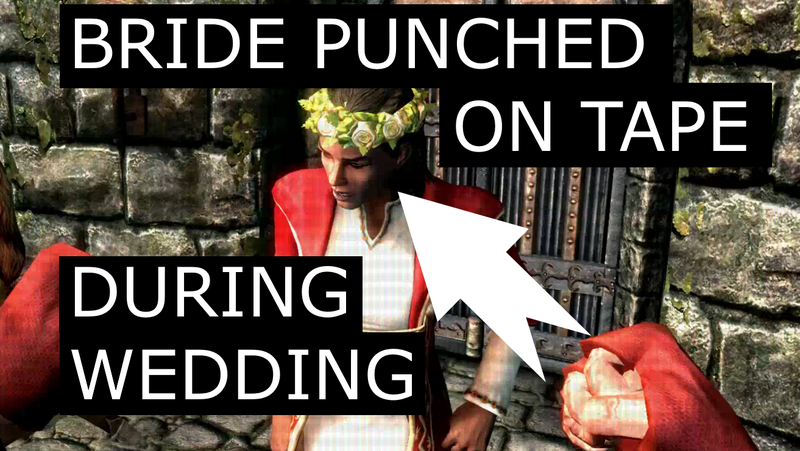 An event out of the ordinary took place during a wedding in Solitude, the capital of Skyrim. The cousin of Emperor Titus Mede II, Vittoria Vici, was about to give herself to her husband-to-be, Aquillius Aeresius, when a prankster decided to get his fifteen minutes of fame by punching the bride. Lucky for us (not for her), the practical joker filmed the entire thing with his headcam. If the video is not shown correctly, find it here (Youtube). It never ceases to amaze what people do to get a few minutes in the spotlight. Despite the Damn fine parkour, no lowered sentence. The reward for his majestic prank is a lifetime stay in Solitude’s correctional facilities. As for Vittoria and her husband, they rebooked the event to another date. Update: It didn’t go very well this time either. Talos, rest her soul.